Nice web site and exhibit. I was born in ’64 and played a lot of pinball well into my teens and beyond…. 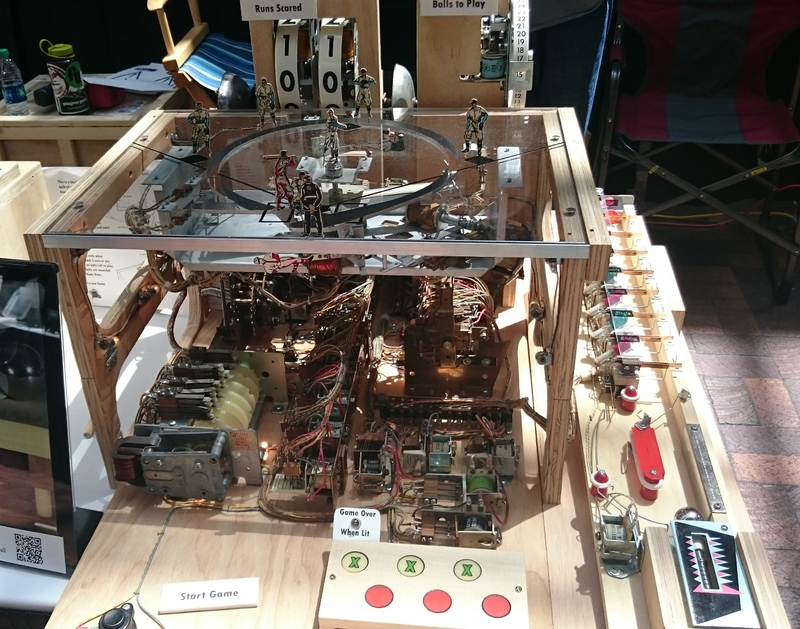 was always in awe when the playing board was lifted revealing all the electro-mechanical guts. Mark brings it all to life and explanation in his web site. Meticulously and carefully laid out. Lots of …. “I remember that” moments. Thank you! I like the giant ‘score counters’. Nice old tech, kinda jealous that [Mark] gets to play inside these and I don’t! Very neat! I actually saw these things at the faire last year. It was very fun to be able to play a pinball machine and see it work inside at the same time! This is awe-inspiring to me because these machines are everywhere, often in not-particularly-working condition, just begging for someone to restore them. But getting every piece working again, all at the same time, can be quite a task! By breaking out the individual modules, Mark has shone light on a few alternate approaches: Perhaps a gutted machine could live on in individual demonstrators like these, which might be really neat in a local science museum or something. Perhaps certain modules like counters and displays could be repurposed into other projects, a cumulative rain counter for one’s weather station, a time’s-up annunciator, et cetera. Or perhaps, by individually understanding and individually operating each module, the divide-and-conquer approach might prove an easier path to full-machine restoration and maintenance.